"This is a good way to get the morning going. Just give yourself about an hour. They are filling and versatile. Kids can also help some." Preheat oven to 400 degrees F (200 degrees C). Grease 18 muffin cups with cooking spray. Roll out biscuit dough on a lightly floured surface to form 5-inch rounds. Place each round in the prepared muffin cups, pressing into the base and sides to form a dough cup. Cook and stir sausage in a skillet over medium-high heat until browned and cooked through, 5 to 10 minutes; drain fat. Spoon sausage into dough cups. Whisk eggs, milk, salt, and pepper together in a bowl until well-beaten. Pour egg mixture into each dough cup, filling each just below the top of the biscuit dough. Sprinkle Cheddar cheese on top of egg mixture. Bake in the preheated oven until eggs are set and biscuit dough is golden, 15 to 18 minutes. 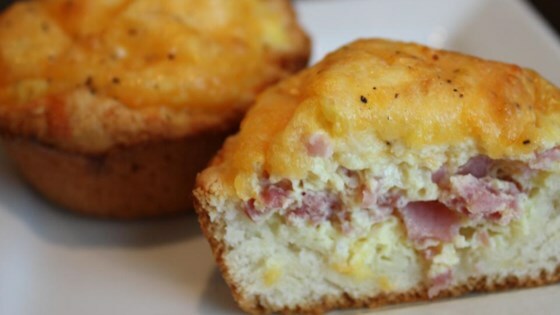 A delicious, savory breakfast for a crowd! You may use any type of meat that you wish. This is very breakfast friendly. My family like to add turkey and bacon sometimes also. Its very tasty. Good with orange juice. WAY too much biscuit. I guess we prefer egg more. Glad to have tried though. I made this but with a flaky dough biscuit and with turkey sausage and they are amazing. Family loved them so guess what I'm making again soon. made it with biscuits from trader joes, spicy linguica, corn, egg and shredded cheese. The corn seemed to keep things moist. Was really good.